Battle of Waterloo commemorative issued… by France! 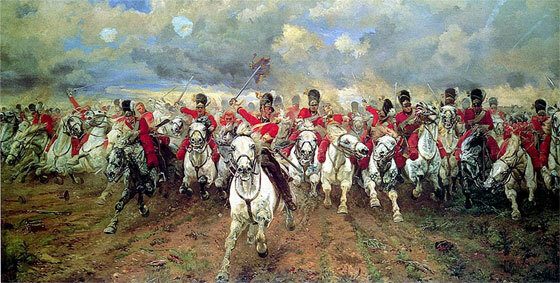 This year will mark the bi-centennial anniversary of the Battle of Waterloo in 1815. But, despite Napoleon’s defeat taking place a distant 200 years ago, it seems that it is still a delicate subject for the French… or is it? 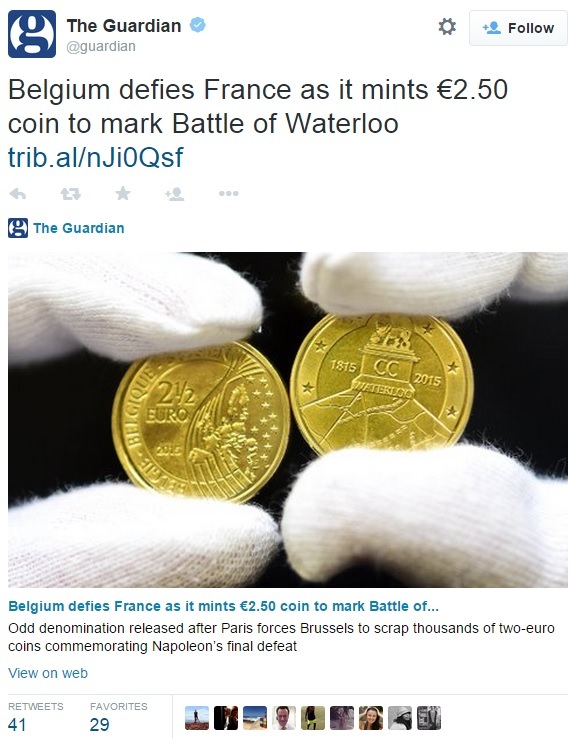 In March, Belgium planned to issue a €2 commemorative Waterloo coin in honour of the historic event. However, after 180,000 coins were minted with the design, France voiced such objection that Belgium destroyed the coins to avoid upsetting their neighboring country. But earlier this week Belgium crushed the French resistance by invoking a little-known European Union rule. It allows countries to issue euro coins of their choice, provided they are in an irregular denomination – cue a new €2.50 coin – a first in Belgium. The coin displays the Lion Hill memorial that marks the battle, with dotted-lines indicating the position of the troops when forces led by Britain and Prussia defeated Napoleon in the countryside near Brussels. Remarkably, the French State Mint issued a Battle of Waterloo Medal after Napoleon’s defeat in 1815. It was designed for sale in the British market by renowned French sculptor Emile Rogat, depicting a fallen eagle on the reverse, symbolising the French Army. The eagle is encircled by four vultures to represent the victorious British, Prussians, Austrians and Dutch and the obverse features an official effigy of Napoleon. It became a piece of history, stored in the British Museum. It’s a great time for collectors during huge anniversaries such as this, as there are so many fascinating coins and commemoratives issued. But perhaps it’s time France looked back at their own history before they complain again! 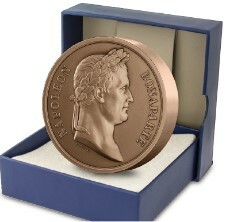 You can actually own a replica of the 1815 French Medal now in the British Museum, reproduced using the original dies.